Premiering on NBC in 1989 and continuing for five seasons, Quantum Leap gained a cult following for its ability to balance the qualities of science fiction with the hour-long television drama format. 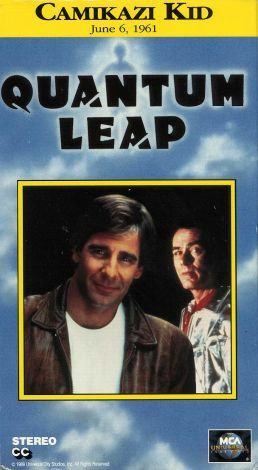 Each episode features a different adventure as Sam Beckett (Scott Bakula) leaps through time, into different bodies, hoping to someday leap home. Along the way, Sam rights wrongs of the past with help from his hologram companion, Al (Dean Stockwell). Quantum Leap: Camikazi Kid finds Sam leaping into the body of an awkward teenager in 1961, with the tasks of winning a drag race and exposing his sister's fiancé's abusive behavior. Jason Priestley guest stars.